Preliminary design plan for a battle cruiser prepared for Captain John Hood of the General Board, apparently requested informally as part of the Boards wide-ranging review of possible cruiser type ships that was underway at the time. This design presented a much larger ship than any other battleship or cruiser yet built for the Navy and presumably was found to be unacceptably large and costly. 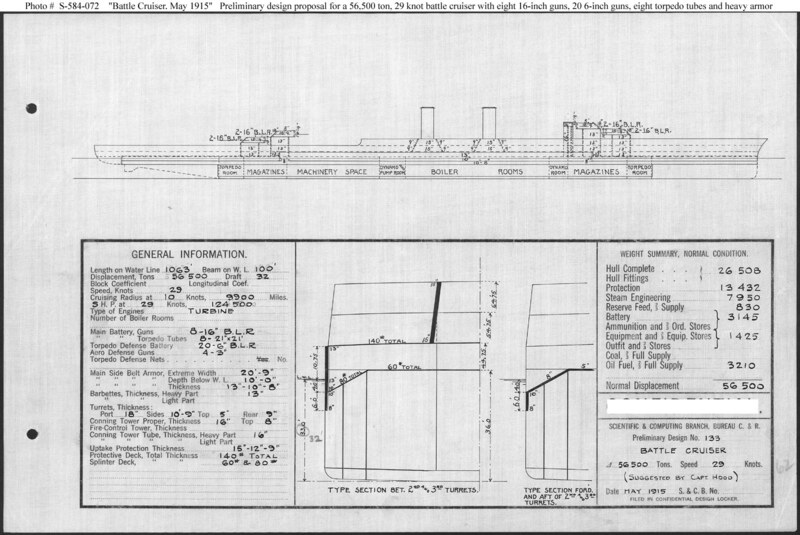 No such ship was built and the battle cruisers ultimately requested and approved in the Fiscal Year 1917 program were somewhat smaller (see Photo # S-584-102). This plan provides eight 16-inch and twenty 6-inch guns, turbine machinery, and a speed of 29 knots in a ship 1063 feet long on the load water line (L.W.L. ), 100 feet.in beam, with a normal displacement of 56, 500 tons.